Oak Meadows Buffalo Ranch is a family owned and operated ranch since 1994. Dedicated to the production and preservation of American Bison, known as buffalo, this family strives to put lean, healthy meat on the table to local customers. Our customers rave about the quality of our products, and the park-like setting in which the buffalo roam at Oak Meadows Buffalo Ranch. They enjoy visiting our ranch, especially in summer months when new calves frolic and play in viewable fields. We are open year round. 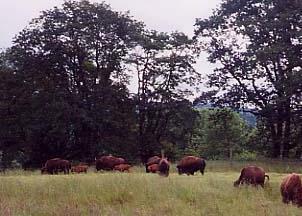 Oak Meadows Buffalo Ranch is nestled in the scenic Chehalis Valley, near Porter. Our ranch is located in Southwestern Washington, within 25 miles of the coast and from Olympia . Our animals browse freely on local sweet grass and home-grown hay and hay products. We are committed to high quality products and happy customers! Buffalo tastes like a wonderful sweet, beef but without all the fat! 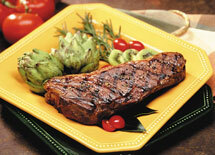 It is low in cholesterol, rich in iron and higher in protein than most meat. It is a great choice for people who care about their health! Cook low and slow for buffalo! Copyright 2010 Oak Meadows Buffalo Ranch. All rights reserved.